Tag Archive | "Marbled Lungfish"
The Marbled Lungfish (Protopterus aethiopicus) is found in the African countries of Tanzania, Ethiopia, the Sudan, Kenya, Uganda, and the Democratic Republic of Congo and referred to by tropical fish keeping enthusiasts as the Leopard Lungfish, or African Lungfish . Marbled Lungfish live in the Nile River as well as lakes Albert, Edward, Tanganyika, Victoria, Nabugabo, No, and Kyoga. Different subspecies are found in the Nile River and lakes Victoria and Tanganyika, (Protopterus aethiopicus aethiopicus) the middle and upper Congo River, (Protopterus aethiopicus congicus) and the lower Congo, (Protopterus aethiopicus mesmaekersi). As adults, Marbled Lungfish are found in swamps, riverbeds, floodplains, and river deltas throughout their range. Juvenile members are often collected between the roots of papyrus plants and despite being an aquatic species, adults can live in riverbeds and other areas that seasonally dry up during portions of the year. Like all Dipnoi, they have the ability to estivate in mucous lined burrows in the ground, and breathe out of a hole in the cocoon they form, for up to several years. The Marbled Lungfish is a smooth, cylindrical, elongated, species with deeply embedded scales and a long tail that tapers at the end. In their natural habitat, fully grown adults can reach almost 7 feet in length. They have very long, thin, spaghetti like pectoral and pelvic fins that they use for gliding through the water column. Newly hatched specimens have branched external gills that look like those of newts or water dogs. After after 2 to 3 months when they metamorphose into their adult form, the gills are replaced by small gill openings that enable them to breathe air. The body of the Marbled Lungfish is a yellowish gray to pinkish color. They have dark, slate gray splotches over their entire bodies and fins which gives them a leopard or marbled look. The color pattern is darker above and lighter underneath their belly. Protopterus aethiopicus does not require much swimming space, but it should be kept in a tank large enough for it to stretch out completely. Because they are slow moving and not particularly active, a 60 gallon tank is sufficient for juvenile to medium size specimens however, they will eventually require a larger aquarium as they continue to grow. Their tank should have a mud, sand, or very fine gravel substrate that will not damage their smooth skin, some driftwood roots and aquatic vegetation for them to hide among, subdued lighting over their tank, and a strong outside canister filter to keep their tank water clean. 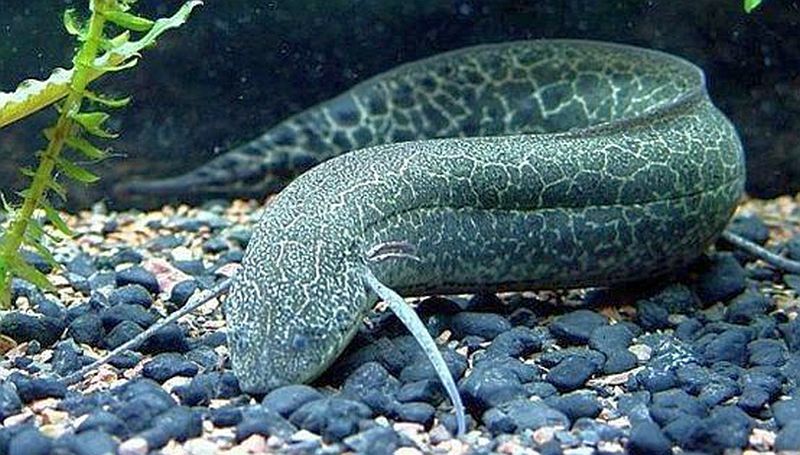 Lungfish are not particularly fussy about water quality and they are quite messy, however they should have clean surroundings to minimize the potential of diseases. Partial bi-weekly 20% to 30% water changes should be performed on a regular basis. Because lungfish must be able to reach the surface of the tank to breathe air, it is important to remove any obstructions that could prevent them from getting a gulp of air. African lungfish are one species that will drown if they are unable to breathe atmospheric air. Marbled Lungfish have not been bred in captivity. In the wild they generally breed during the flood season immediately after the first rains. The males prepare a “pit” type nest or a deep hole for one or more females to lay their eggs in. When the eggs are laid and the male fertilizes them, he will guard the nest and oxygenates the eggs to ensure their survival until they hatch, in approximately 8 weeks. During the breeding season, adult males develop a structure in their pelvis that enables them to filter gasses in the air and use this to increase the oxygen levels in the nest. After hatching, the young look like little tadpoles and have branched external gills that look like those of a newt or water dog. After 2 to 3 months the young metamorphosize into their adult form and lose their external gills to gill openings. Adult Marbled Lungfish have a diet that consists largely of mollusks, such as Mutela bourguignat (mussels) but they also eat small fish and insects. Juveniles have a diet that consists almost entirely of insects. In an aquarium environment, they will eat almost anything they can get into their mouths. They need meaty foods to thrive and should be provided live, fresh dead, or defrosted small fish, chunks of fish, earthworms, shrimp, clams, crawfish, mussels, or insects. You can use tongs to hold their food in front of them to make sure it is quickly eaten and not foul the water. Juvenile Lungfish should be fed twice a day, but as they mature they only need to be fed 2 or 3 times per week. The Marbled Lungfish or Leopard Lungfish is occasionally available as a “special order” but the price is usually high. Albino Marbled Lungfish or Albino Leopard Lungfish are rarely available and command much higher prices. At least three subspecies of Protopterus aethiopicus are sold by tropical fish keeping shops as “Marbled Lungfish” and all are similar. 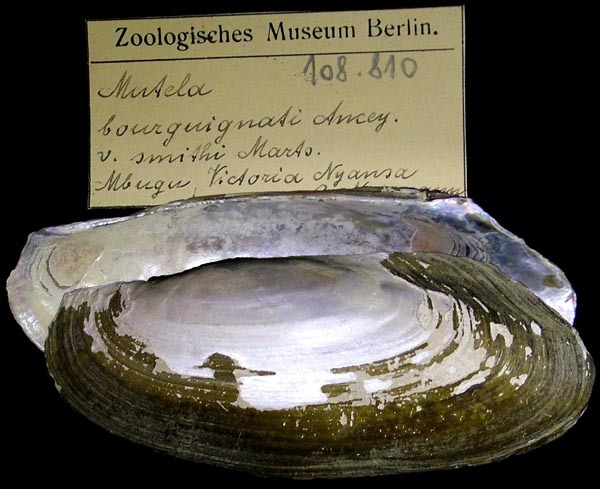 The most significant difference between the subspecies is their maximum size which cannot be determined without knowledge of which area the specimen was collected from. The most common subspecies is Protopterus aethiopicus congicus.